Furnishing a small balcony or patio is easy when you go for smart outdoor furniture that can be stacked or folded. We picked five contemporary chairs from Finnish Design Shop's selection that excel in small spaces. The Week-end chair plays with alternating lateral and vertical lines. The red table in the new series is available for order. The Week-end outdoor furniture is a new collection this spring. The series can easily be distinguished from its oval-shaped details of the back and the alternating lateral and vertical lines. Made by the French design brand Petite Friture, the aluminum furniture is not only light but also durable in varying weather conditions. 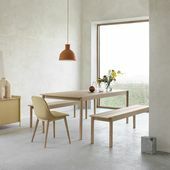 With no arms, these Week-end chairs can be nested underneath a table from the same series, and so take up little space. The 13Eighty chair took two years to develop. The design represents an optimal combination of lightness and durability. The perforated surface of Hay's 13Eighty chair serves both as an ornamental and functional element. In sunshine the holes create a play of light and shadows around the chair, and in rain the water can penetrate through the holes. The attractively bent polypropene chair is equipped with slender metal pipe legs. Designed by Scholten & Baijings, the light and stackable 13Eighty chairs are available in black, white and soft pastel colors. The Terrazzo table by Daniel Enoksson is also from Hay. 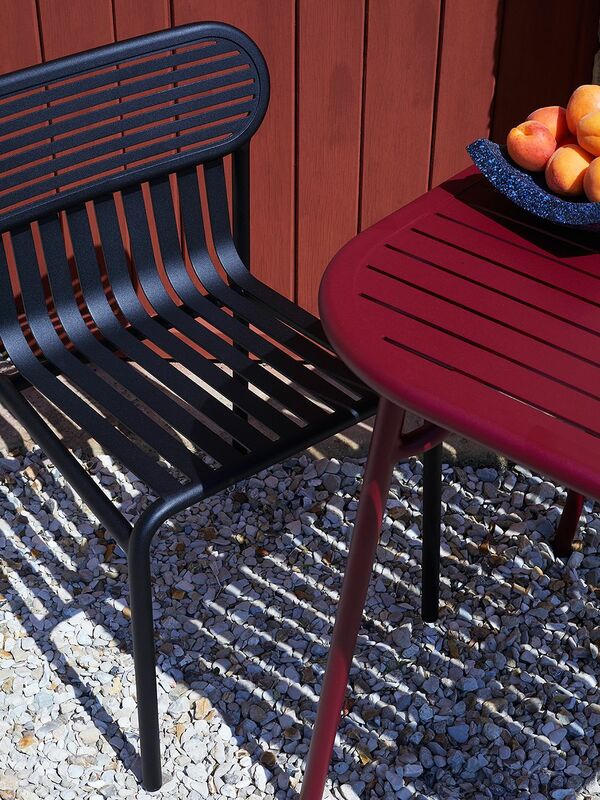 The plastic Belleville chair is suitable for outdoor spaces. Veneered chairs for indoor use are also available. Vitra's Belleville chair is a modern, stackable plastic chair with arched lines that remind us of classic café furniture. 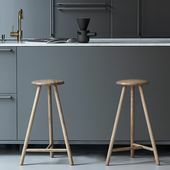 The designer brothers Erwan and Ronan Bouroullec named the Belleville series after the Parisian suburb known for its café and restaurant culture. The Belleville collection also includes chairs with arms and a graceful, round table. 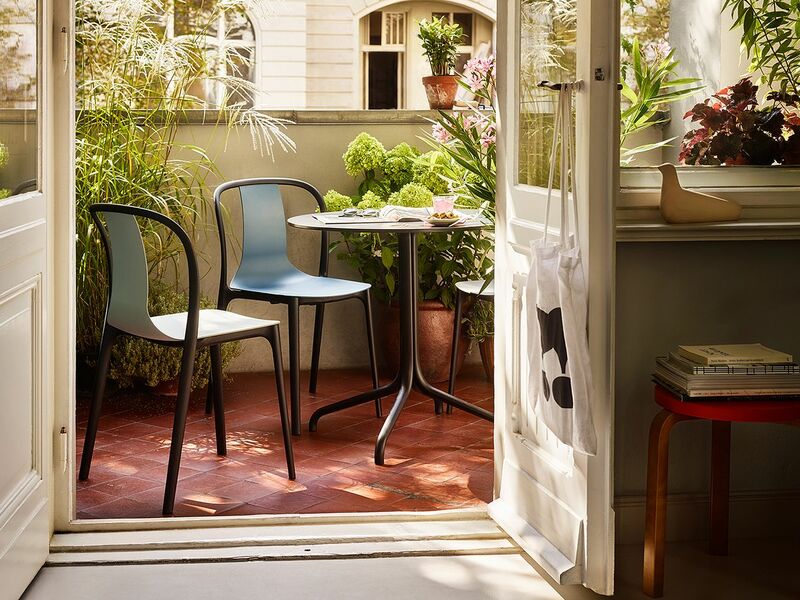 The arched lines of Vitra's Belleville chair reminds us of classic café furniture. 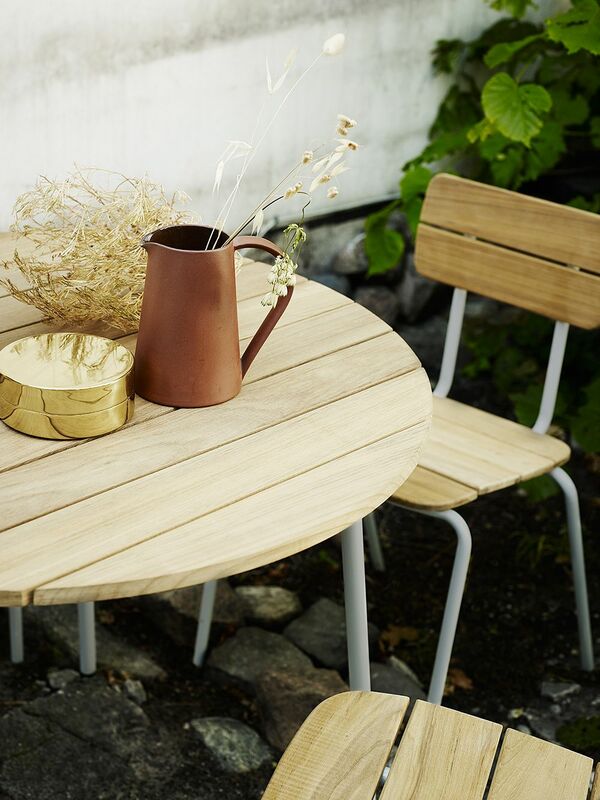 Skagerak's Flux furniture is a combination of teak boards and durable metal parts. 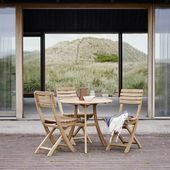 Skagerak's Flux chair brings a combination of Nordic and French design traditions to your garden or balcony. The seat and the back of the Flux chair designed by Jonas Herman Pedersen are made of honey-brown teak boards with smoothly rounded corners. The pale-colored metal frame gives the chair a light appearance and a stackable structure. The round table from the same series suits well with the Flux chairs. 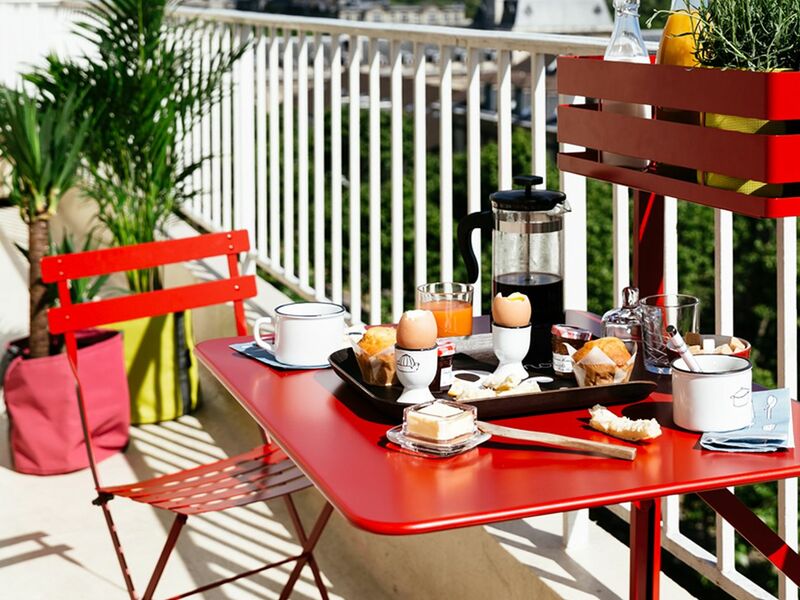 Breakfast can, weather permitting, be served on the balcony. The classic Bistro chair comes with an unrivalled selection of colors – Finnish Design Shop has them available in 22 colors to choose from. 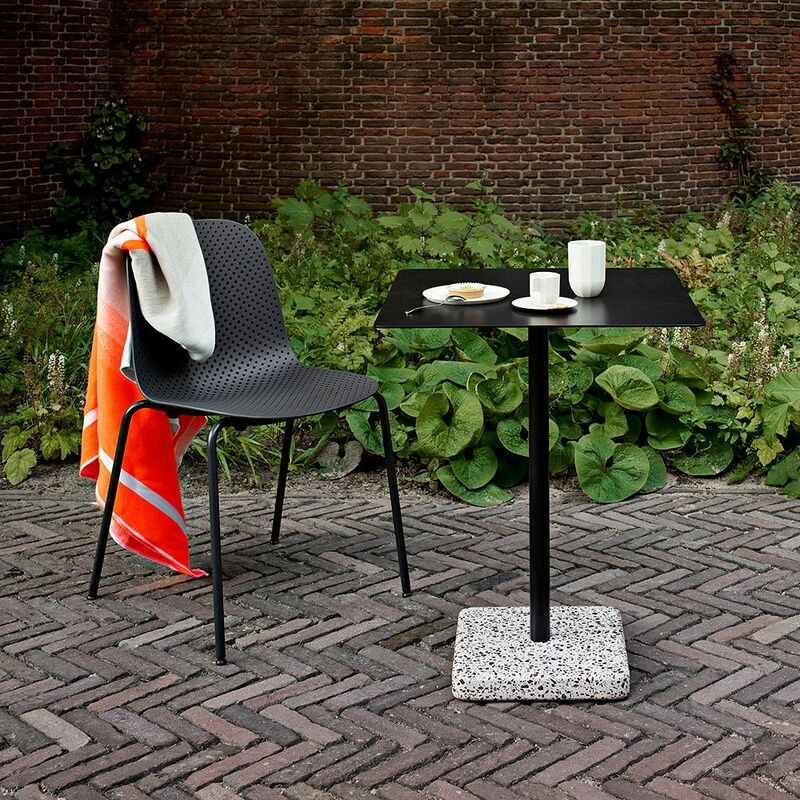 Not only beautiful and handy, Fermob's foldable Bistro Metal chair is also weatherproof. Owing to the painted UV-protected surface, its colors remain bright for years. Despite its slender design, the stylish metal chair is sturdy. Easy to store folded, it takes up very little space. It is a good idea to combine the iconic Bistro chairs with a table from the same series.